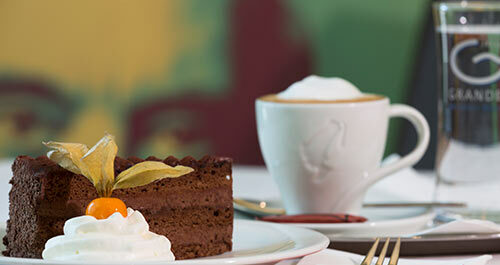 Also the Cafe Giacomo Aragall – one of Vienna’s most central hidden gem’s – is currently closed for renovation. As of summer 2019, guests may again indulge in warm colours, fine woods and unique art, which make up the distinctive atmosphere of this popular local destination named after the Spanish tenor and chamber singer Giacomo Aragall. We are very much looking forward to welcoming you back again as of summer 2019 – the impressive view of “Steffl” always included. The day is about to start just right with our rich and healthy breakfast buffet. 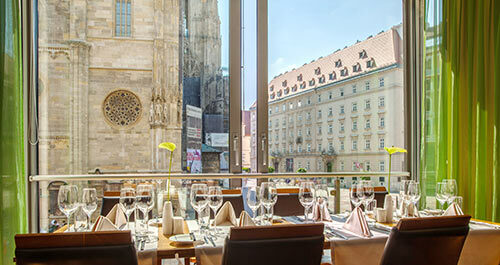 A varied selection of hot and cold dishes, freshly squeezed juices, Viennese coffee specialities and much more can be enjoyed together with the spectacular view of St. Stephen’s Cathedral. 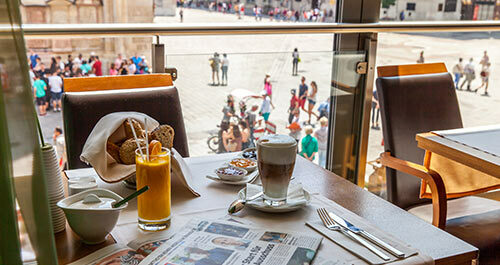 Viennese coffee specialities, home made sweet dishes, cakes, as well as classic hot and cold Coffeehouse snacks can be enjoyed together with the unique view over St. Stephen’s square. Have a look at our menu as of summer 2019 HERE. Book our Café as an exclusive event location with unique and breath-taking view over St. Stephen’s Cathedral for your private party, business event, cocktail reception, and much more as of summer 2019. The famous namesake of our Café is the noted tenor Giacomo “Jaime” Aragall, who prefers to exclusively stay at our hotel when visiting Vienna. Since the owners are admirers of Senor Aragall’s art, it was easy to find a suitable name for this cosy bar. Opera lovers will always remember the Catalan tenor and chamber singer for the Vienna State Opera. 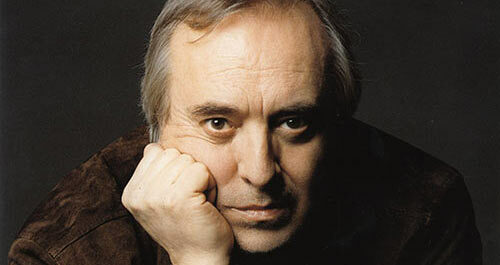 He has made music history with his starring roles—as lyrical Rodolfo in “La Bohème”, passionate Cavaradossi in “Tosca”, or Pinkerton in “Madame Butterfly”, among many others. This exceptional artist stays at the Boutique Hotel am Stephansplatz every year and also visits the bar dedicated to him. Who knows – perhaps you’ll be lucky enough to meet him in person during your next visit? 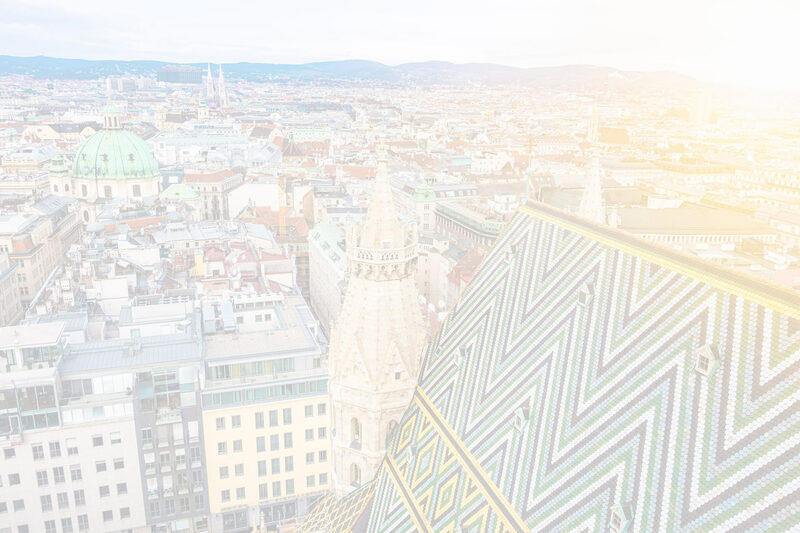 No matter if it is spring, summer, autumn or winter: Vienna is always en vogue. We are looking forward to your table reservation as of summer 2019!